OK, so you’re sending snarky emails in the heat of the moment? Maybe you told off a co-worker or your boss in an interoffice communication? Or worse, had the mother of all rectal-cranial inversions and told your spouse where to get off in an email? 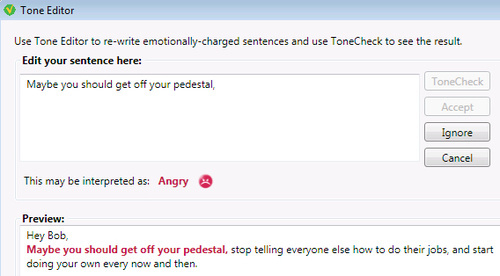 ToneCheck is an email plug-in that checks the content of your emails for tone and alerts you to language that may be misunderstood or interpreted as particularly negative … let’s face it: Sometimes you send an email that you fully intend to convey anger or annoyance. But text communication is rife with misunderstandings, and often an email with perfectly pleasant intentions can lead to a lot of upset coworkers. That’s what ToneCheck aims to address. I find this a little disturbing, actually. Let’s get in the toboggan and ride the slippery slope for a minute: I can see versions of this that can plug into your word processor, and screen out any language that is not deemed politically correct. Under that scenario, I might be tripping that alarm an awful lot. Right now, it’s in beta and during this period it is free. So far, this works only with Windows systems running Outlook, though I understand other versions are in the pipeline. I don’t think I’ll be beta-testing this one. Have you checked your inbox lately? Yeah, I’m in another one of those moods. I’m not sure who originally wrote this, but I like the idea. It was one of those Fw: emails that crosses my transom, sent by my mom. In all, it sounds like a good workable solution. Later with all these pat-downs at the airport security line and invading your carry-on luggage. This is quick, clean (well, sort of), and cheap in the long run. Have a booth that you can step into that will not x-ray you, but will detonate any explosive device you may have on your body. It would be a win-win for everyone, and there would be none of this crap about racial profiling and this method would eliminate a long and expensive trial. Justice would be quick and swift. See, it could work. Who’s with me on this?